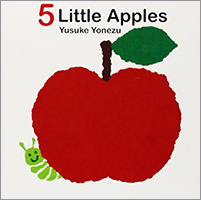 Yusuke Yonezu is an author and illustrator of children’s books, including the Guess What? series, Moving Blocks, Please Don't Cry, Rainbow Chameleon, We Love Each Other, and Yum Yum! The flaps reveal the creature that eats an apple in this board book that helps little ones count backwards. An elephant, a rabbit, and a caterpillar are some of the hungry critters who take apples away. But when there are none left, a surprise awaits.